The BBC have confirmed details of three new Dragons set to join Peter Jones and Deborah Meaden for the next series of Dragons' Den. 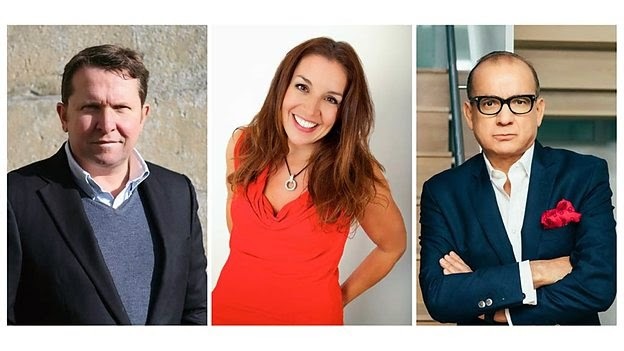 The new Dragons are Nick Jenkins, business investor and creator of one of Britain’s leading online retailers; Touker Suleyman, a global clothing manufacturer and serial retail entrepreneur and Sarah Willingham, a global restaurant entrepreneur, serial business investor and leading consumer expert. The trio will join existing Dragons, Peter Jones and Deborah Meaden in the successful entertainment format, which sees budding entrepreneurs enter the Den to pitch their business ideas to the multi-millionaire Dragons willing to invest their own cash. It has been ten years since the doors first opened to the Den and nearly £15 million pounds worth of investment has been offered by the Dragons who have graced the iconic chairs. In 2003 Sarah spotted an opportunity to create a chain of Indian restaurants, but her business plan was rejected, so she struck out on her own and raised finance to buy The Bombay Bicycle Club, turning it into the largest and most successful Indian restaurant chain in the UK. In the same year, at the age of 31, Sarah sat on two plc boards and successfully floated a nutraceutical business on the London Stock Exchange. A few years later, Sarah sold her shares in The Bombay Bicycle Club for a seven figure sum. Sarah co-founded and invested in The London Cocktail Club and Craft Cocktail Company and has helped grow these two concepts into award-winning businesses. She is also the co-founder of Letssavemoney.com and regularly offers money saving advice on TV, print & online. Today, Sarah runs her business portfolio from her home office alongside her entrepreneur husband and together they jointly invest and support more than 10 business ventures, from start-ups to established and growing brands in the food and drink, consumer finance, health food, banking, mining, technology, lead generation and entertainment sectors, most of which are located across the UK, Middle East and North America. Dragons' Den returns later this year on BBC TWO.